If the midwest was suddenly to be overrun by hoards of the living dead, there’s not a doubt in my mind that Harley Poe would provide the soundtrack. The Kokomo-based quartet just released their newest album, Wretched, Filthy, Ugly on Chain Smoking Records, and will be celebrating with a show at The Brass Rail on May 28th with local support from The End Times Spasm Band and Poopdeflex. That lineup was not to last, however. “They stayed on to record that album and then everybody went their separate ways.” Undaunted, Whiteford continued to play shows under the Harley Poe moniker as a duo with drummer Christian Riquelme, a fellow resident of Kokomo. 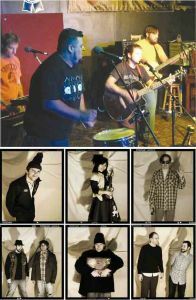 They then went through a couple of lineup changes, with a couple new members coming and going, until recruiting Gregg Manfredi and Kevin Phillips on keys and bass, respectively, for the band’s 2007 split CD Harley Poe and The Dead Vampires, also on Standard. This lineup stuck, and has remained constant to this day. Whiteford describes Harley Poe’s overall sound as being “a bit horror themed, gothic, but also humorous. I love The Cramps, but I don’t think you hear them in the music. I also love The Violent Femmes, who you can definitely hear in there.” Also citing surf rock and punk bands such as Dead Kennedys as influences, Whiteford added “but while I like all of that I don’t think I’m really trying to emulate that sound very much, except for The Violent Femmes and The Dead Milkmen, as far as that quirky punk sound.” It’s a pretty good description of the band’s sound, too. You may need to listen to “Wretched” a couple of times to really hear all the subtleties going on, but repeated listens conjure up the thought that if Gordon Gano of The Violent Femmes had locked himself in a room for a month with nothing but a case of Red Bull and a copy of The Dead Milkmen’s Big Lizard in My Back Yard, what would come out of it would be Harley Poe. All of this self-deprecation and half-joking way of speaking might lead some people to believe that the members of Furious Frank don’t take their music seriously. Nothing could be farther from the truth. Payne is a funny guy, but there’s no way Furious Frank’s music could work without a lot of hard work. That kind of work ethic is apparent on songs like “Another Life,” and “The Coroner of Drifters Creek.” These tracks showcase a band that, for all their quirks, make truly orchestrated music that shouldn’t work, but does. The first is a good picture of the mariachi-esque music Payne initially described, with great horn lines and the back-and-forth 5ths of the bass. It’s a great song, but “Drifters Creek” takes you by surprise with its syncopated counterpoint (if there is such a thing. My theory is a bit rusty) between the horns and stringed instruments, and stylistic leaps between gypsy music, western swing, and punky guitar. It’s infectious music, and I am really interested to see how it sounds live with all of those musicians crammed onto The Rail’s stage. 15 people	reviwed this story with an average rating of 2.6.